Order a plant and candy. The Sunshine Spirit Mini Rose bursts with the warm beauty of hopeful happiness! 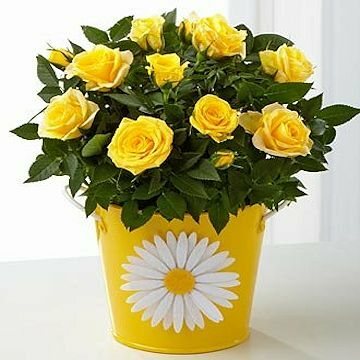 A gorgeous mini rose displays sunlit yellow blooms while seated in a bright yellow metal container decorated with a white daisy for a sweet and cheerful look. Deluxe plant is approximately 6.5-inches in diameter. Premium plant is approximately 8-inches in diameter. *Please note that the containers may vary.